It’s a workbook, not a generator to be used at the table. It helps if you are slow and methodical like I am but would like to be pushed like I’d like to be pushed. Some days have passed and here’s what happened. I knew an elven ruin was to contain a seclusium and and started working on one, using The Seclusium of Orphone of the Three Visions as my workbook, naming my seclusium the same, but not using the most fleshed out seclusium in the book of the same name. I was starting from scratch. I wrote a lot of stuff. 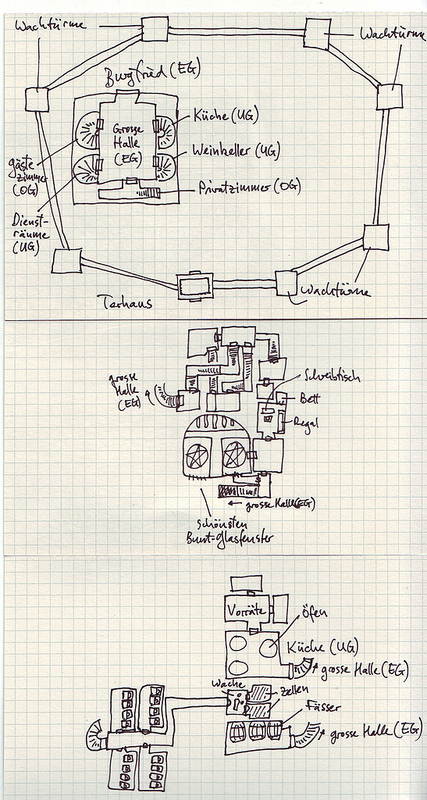 Then I started sketching a map. Or was it? It’s more of a doodle, I guess. And I wrote notes, I read the book, I rolled some dice, walked away, came back, did it again, did it again. It was slow. Finally I decided that drawing a detailed map was going to be a major pain and started writing about the non-player characters still present. I ended up with interesting characters, but I was starting to grow suspicious. It had taken me an awful lot of time. 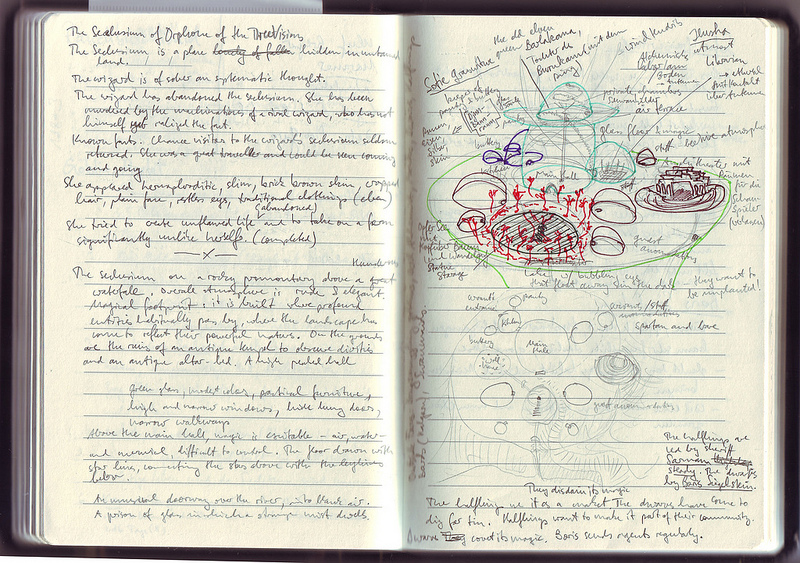 And I started to feel that these dense scribbles would require a rewrite in order to be usable at the table. Too much of this text wasn’t going to be useful or was going to obscure the important bits. I guess some people might say that writing about these characters can be seen as “familiarizing myself” with the characters, getting to know them better, being able to play them better. I decided that it was taking too long and switched to one of the semi-prepared seclusiums. I wondered: would I be saving time? 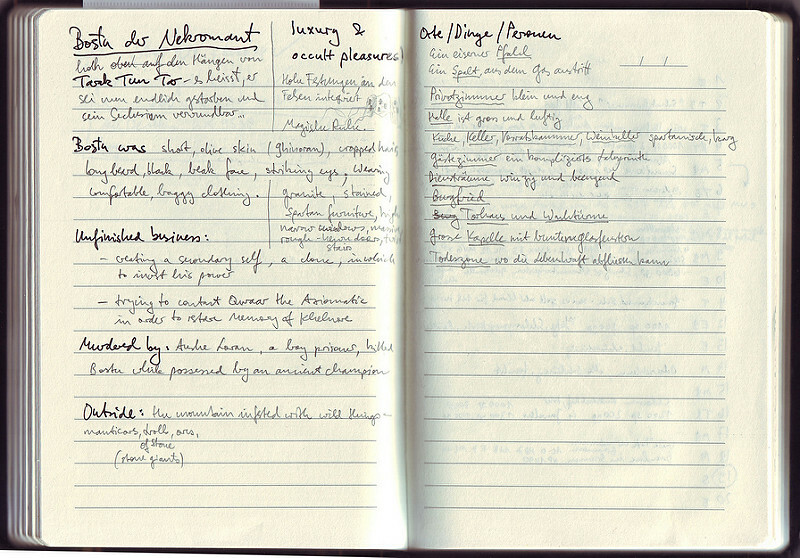 I knew that some of the things were going to need rearrangement on the page, some things needed to be highlighted, so I tried keeping my notes more organized. Soon, however, I started wondering about a map. Should I just draw a flow chart? Or simply have a list of locations and allowing player to move at will between the various sections—much like I use my hex maps. Move at will between locations, distance is proportional to the number of potential random encounters. I decided I was going for a few details on some larger index cards. I was tempted to draw more details, doing it the old school way. I tried to counter this by drawing sloppily. And no take backs, no pencil. Use the pen. I wasn’t happy. I left it lying around for another day or two. Game day was coming up. And I had nothing. In the two hours before the upcoming session, between preparing dinner, talking to my wife and munching, I decided to just pull out one of the maps by Paratime Design Cartography. 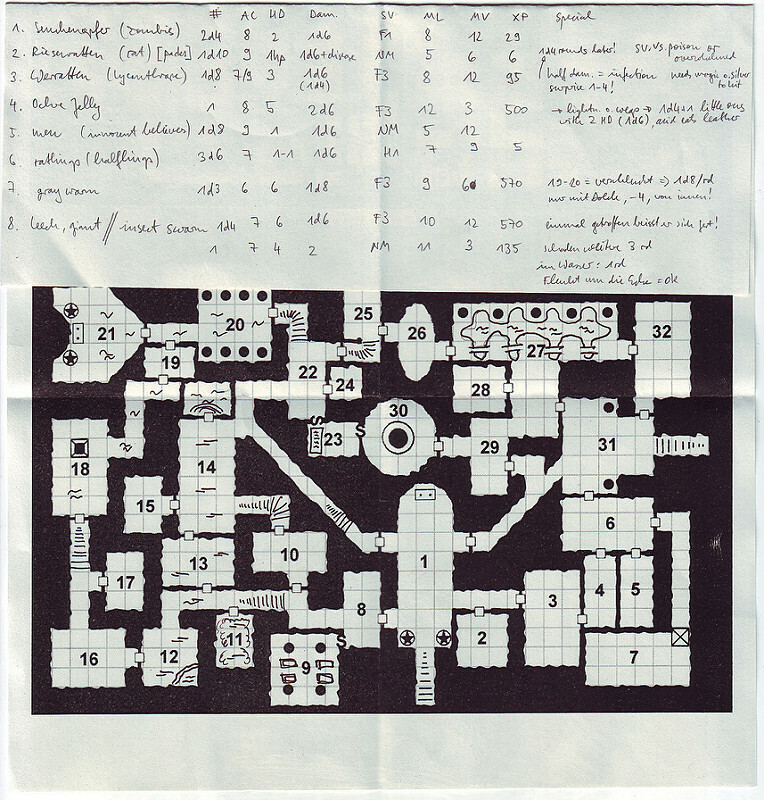 I don’t always like the maps, some are too simple, some are awesome and intimidatingly complex for an hour of stocking, but I finally settled on half of Dungeon Map 80 which you should find on page 4 of the Dungeon Map gallery. I started with a list of random encounters. This was supposed to be a temple to the god of the dead and the diseased, Nergal, lord of the Underworld. The temple itself was being run by wererats keen on poisoning wells and spreading lycanthropy. I used my pen to add more steps, add mud and pools. It was fun doing this. Then I pulled out Moldvay Basic Dungeon Stocking table (Michael Curtis at one point discussed its genius) and had my wife roll like crazy. As she called out “Empty! No treasure. Monster! Treasure!” I scribbled like crazy. As you can see, I still had two specials, three monsters and three traps to provide, but I felt ready to rock and roll! The irony of preparing for a session is that players don’t do what you expect them to do. They don’t even do what we agreed upon doing by email a few days ago. they visit the elven ruin where I had planned The Seclusium of Orphone of the Three Visions. I was going to find out whether my premonitions were correct. And they were! The wall of scribbled text was impossible to read—I basically limited myself to the map doodle and whatever I had written on it. The non-player characters came up but I could have characterized them with four words each and it would have worked just as well. I end up agreeing with the quick review written by Zak S. Going forward, I will “raid it more than use it.” Maybe it makes good material for the special rooms indicated by the Moldvay dungeon stocking procedure. Excellent post. I always use the Moldvay dungeon stocker, though in its BECMI iteration. Random generators <i>work<i>. Thanks for posting this. 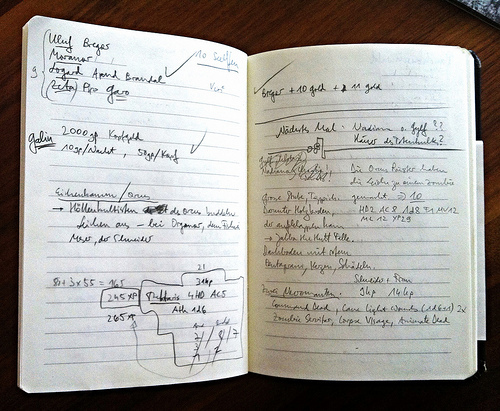 I’m really impressed by the discipline that goes into creating a game notebook like that, too. It will end up as a fascinating artifact of play by the time it is filled up. In contrast, my notes are scattered all over the place, on scraps of paper, and various files all over my computer. 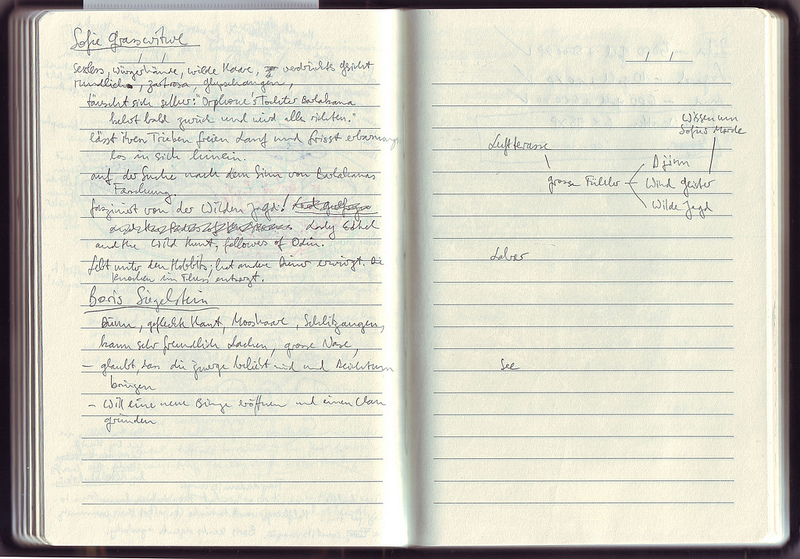 As for the game notebook, I think the key is that you need to have it (having an empty notebook lying around makes it easy to pick it up and write there instead of some random scrap of paper), to liberally glue any other notes you made into it, to use it at the table as well: start with the list of characters present, use it for monster hit-points when fighting, add your notes about things you need to check after the session (updates to the campaign wiki, for example). I’m not scanning those pages because they look far less impressive. 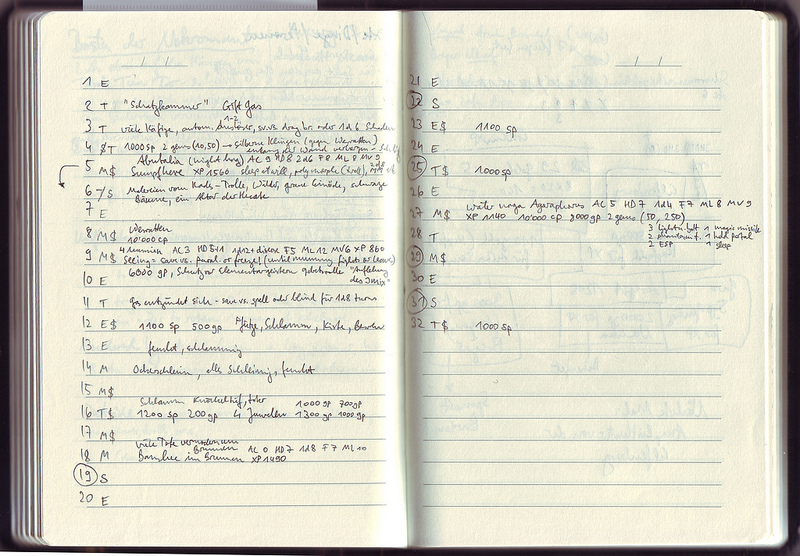 Then, when you prep for the next session, just keep using the notebook. Review stuff, write some new things. Compared to a wiki, it’s hopelessly disorganized. Compared to a binder, it’s inflexible and cannot be reorganized. But it’s the One Book to rule the campaign. This works particularly well if you run multiple campaigns. Each has its own notebook.